I have to share an early surprise for the big "50" birthday that will happen next week. I am the proud owner of 28 blocks to use in My Dear Jane Quilt that I hope to start this year. Many Thanks to my friend Sandi (aka kwiltnkats) for organizing the block making with family and friends. I know it wasn't easy, but the results were amazing-see below. 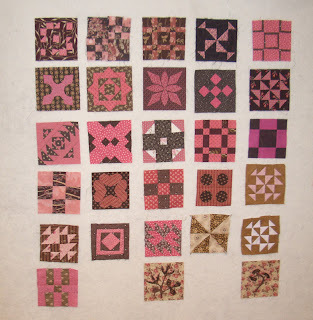 I have always wanted to make a Dear Jane Quilt and have been collecting pink and brown fabrics just for that purpose. 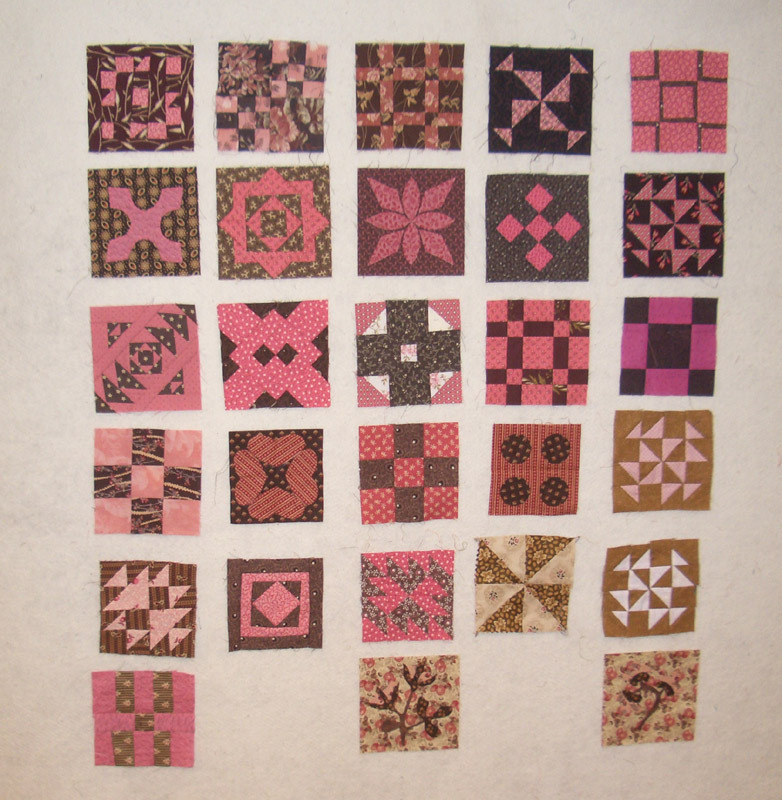 It will be very special to include all of these blocks in the finished quilt. My other birthday surprise is a trip to Asilomar in Pacific Grove, CA, where I will be taking a Dear Jane Workshop with Brenda Papadakis!! Guess I will be starting that Dear Jane Quilt sooner than I thought! Will keep you all posted on the progress. What is on your design wall this week? Don't forget to check out all the other inspiring projects at Patchwork Times. I have had the book for many years and have never taken the plunge. Having blocks from your friends and family will make this quilt much more special. Happy Early Birthday! Happy Birthday! Your friends and family hit a home run with their gifts. You'll not only have a great experience at Asilomar, you have a great start on your Baby Jane. Those are great blocks. enjoy your retreat! Wishing you the best of birthdays, hope you enjoy the retreat. You received some great blocks. Enjoy it all.